Hits on Gov. Rick Perry’s virtual border fence Web site are dwindling, even as he prepares to spend another $2 million to keep the program running. A review of Web traffic data by the Texas Tribune shows a steady drop over the last year in the number of people who log onto the Texas Border Watch Web site to patrol for illegal immigrants and criminals. With few visitors to the site, experts say the Texas Border Watch likely won’t detect many criminals or produce promised advertising revenue to sustain itself. “I’d call shenanigans on that; there’s just no way,” said Paul Pellman, CEO of Click Forensics, which monitors Web site traffic for online advertisers. Compete Analytics, a site companies use to monitor Web traffic, shows the border camera site attracted just 151 unique visitors in September — a steep decline from the 12,000 visitors last December. An expert in crime surveillance called the program an extreme waste of money. “It’s probably a boondoggle,” said Jennifer King, a researcher at the University of California Berkley School of Information, who has studied camera crime surveillance. Perry and the Texas Border Sheriff's Coalition, the group in charge of the operation, argue that the cameras are an effective deterrent that, in time, will prevent crime and turn a profit. BlueServo, the company that operates the cameras and has made more than $450,000 from the program, claims tens of millions of hits to the site and says traffic is growing. “The Virtual Border Watch program continues to serve as an efficient tool that augments and amplifies the ability of law enforcement to monitor, detect, prevent and deter criminal activity along the border,” Perry spokeswoman Katherine Cesinger said in a written statement. 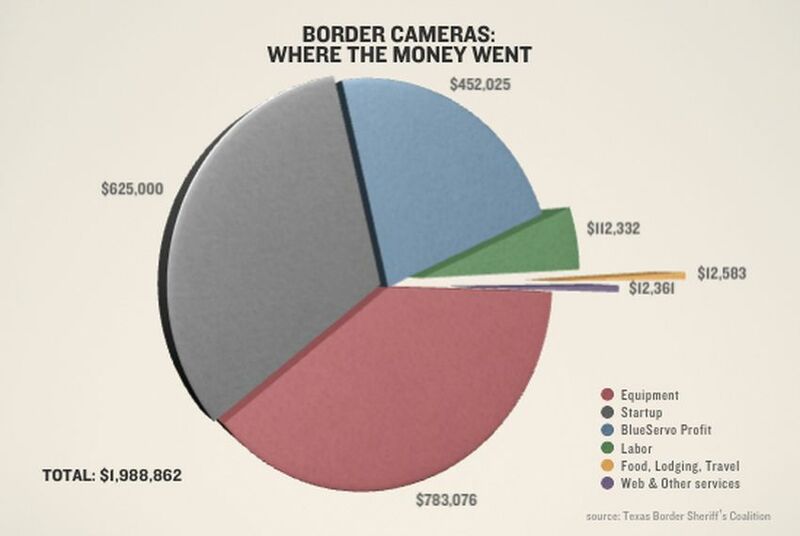 Perry birthed the border camera concept during his 2006 gubernatorial reelection campaign. After fits and starts, BlueServo and the Sheriff's Coalition launched the border watch Web site in 2008 with $2 million in grant funding from the governor's office. This fall, Perry awarded the Sheriff's Coalition another $2 million to keep the cameras rolling. The program is part of more than $200 million Perry and state legislators have poured into state-led border security operations since 2006. The contract between BlueServo and the Sheriff's Coalition calls for the company to sell advertising on the Web site to help finance the camera operation. But with few visitors to the site, it is hard to attract advertisers. BlueServo, the online social networking company that operates the cameras, declined to provide internal reports documenting traffic to the site. At least two independent Web traffic analysis programs, though, indicate traffic has ebbed. Save for a spike in March, traffic has steadily dropped since December, according to Compete’s analysis. Unique users to the site jumped up to about 7,000 in March, then fell to about 1,600 in May. From August to September, new monthly traffic dropped from about 740 visitors to about 150. Alexa.com, a similar site that tracks online traffic, shows a 50-percent decline over the last three months. Asked about the Web traffic, BlueServo spokesman Joe Milam said the company’s data shows increasing hits to the site. Sites like Alexa and Compete, he said, base their data on estimated traffic numbers. Actual site metrics from BlueServo servers, Milam said, show traffic growth. But he declined to provide that data. “The number of hits as of May 13th was 37,293,938, and as of today they are 50,610,169, which is a significant growth rate,” Milam said. Even BlueServo’s total hits number indicates a drop-off in usage, though. The camera site launched in November. Based on BlueServo’s numbers, the site averaged about 6.2 million hits per month through May. Then the hits dropped to about 3.3 million per month from May through September. But the number of “hits” on a Web site is meaningless, said Berkeley researcher King, whose report on the San Francisco surveillance program was released last year. That figure captures every page viewed but provides no data on how many people visited the site. Measuring unique visitors gauges the size of the audience. It would be valuable also to monitor how long people spend watching the cameras, King said. BlueServo sold no advertising during the first year of the program. Milam said the first year was for building the site, attracting users and evaluating its law enforcement value. “We will use this success to pursue advertisers this year,” he said. With the kind of traffic the camera Web site is generating, Click Forensics’ Pellman said it is unlikely companies would buy enough advertising to sustain the project. In general, he said, a site should attract about 1 million users monthly to generate $2 million in yearly ad dollars. “To ever say this business would be self-sufficient from an ad standpoint is ridiculous,” Pellman said. With limited traffic, and no way to ensure viewers spend quality time watching the cameras, the program also likely won’t deter crime, said surveillance expert King. “Without some kind of incentive system to keep them there, I imagine a lot of people sign up to watch a camera for three minutes and decide this is really dull,” King said. The border cameras are trained on a variety of terrains. None have much activity to keep viewers engaged. Another camera panned over vast scrubland with what appeared to be a highway in the background. Viewers were instructed to report people or vehicles in the area. King and her colleagues at UC Berkeley last year studied crime surveillance cameras in San Francisco. The city installed 71 cameras in areas plagued by violent crime. The study concluded the cameras had no effect on violent crime, but that property crime dropped. Reports from the first year of the border camera program show it fell far short of its initial law enforcement goals. “To think they can make the program sustainable and effective... and worth the money the way they have it designed right now, I would say that’s not going to happen,” King said. And she said Texas seems to have paid an exorbitant amount for the small number of cameras that have been installed. San Francisco paid $700,000 for its 71 cameras. Hudspeth County Sheriff Arvin West, chairman of the Sheriff's Coalition, said the camera program has been a useful law enforcement tool. West, who also recently appeared in a reelection campaign video for Perry, said having the cameras in place means small departments like his need to keep fewer deputies on patrol. Deputies in his county have responded “a few times” to reports from online border viewers, West said, though he didn’t provide hard numbers. West said reports he has seen show that viewers are spending about 10 minutes per sitting watching the border cameras. With time, he said he is confident the Web site will succeed.